The main concept of a cruiser tank, as defined by the War Office in 1936, could be traced back to the end of the Great War, when the first Mark A “Whippets” were committed into action. Their main goal was to exploit breakthroughs and create havoc behind the enemy lines, disrupting lines of communication, destroying depots, artillery positions, and preventing reinforcements from arriving. The cruisers were designed to bypass enemy strongpoints and spearhead the advance of a motorized division. This concept required a relatively light tank, fast, well-armed, possibly with a good communication set. 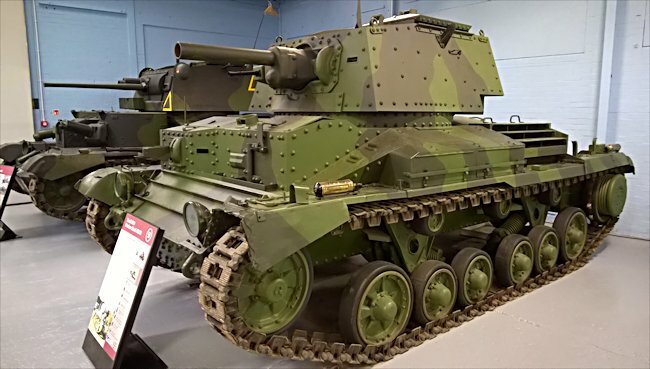 At the same time, Sir John Carden, then chief engineer of Vickers, had drawn plans for a “reasonably cheap tank” which could fill the army requirement during these low budgetary years, to replace the Mediums then in use. 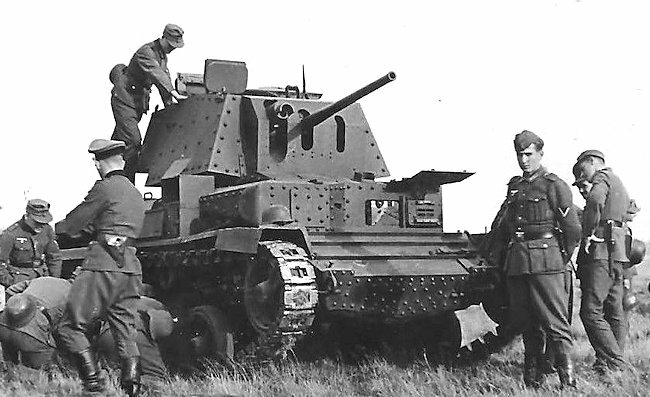 The A9E1 prototype was finished in 1936 and demonstrated to the War Office. The Cruiser Mark I was at its origins a “cheap” medium tank, comparable to the contemporary Infantry Tank Mark I. The A9E1 borrowed as many featured from the previous Light Tank Mark III, but also parts and equipment commercially available, in order to reduce the conception costs. This helped to lower the unit price and brought formal approval and a 125 unit order from the War Office, as the Cruiser Mark I, in 1937. With a crew of 6 in a cramped space, the Mark I literally bristled with armament, the two front turrets each bearing a .303 (7.62 mm) Vickers machine-gun, while the main turret had a third coaxial one, coupled to the main QF 2-pounder (40 mm/1.57 in) gun. This gun had the punch required against armored tanks and light tanks. The tradeoffs were an entirely riveted hull, thin armor and the unique suspension system, combining two bogies (coil springs), each with a large and a pair of small road wheels. This was intended to procure better ground pressure and smoother ride with the minimal amount of parts, and easier and cheaper maintenance. This system was seen as an interim before the new Christie system could be adapted. Both Harland and Wolff and Vickers delivered the order until late 1940. The first were operational with the RTR in January 1939. 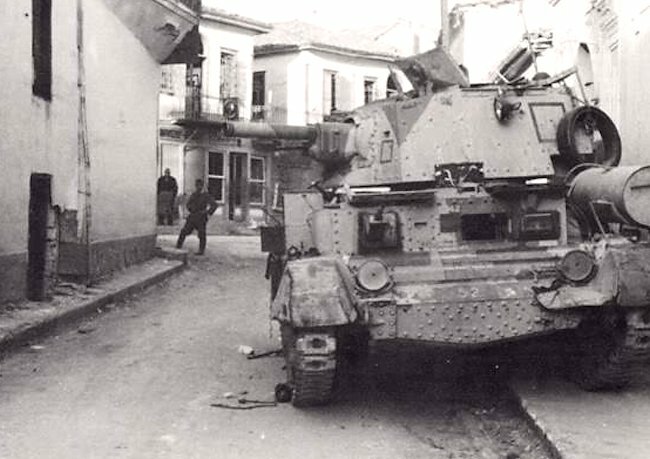 Although fast (24.9 mph/40 km/h), the first Cruiser lacked protection, with just 14 mm (0.55 in) on the turret mantlet and nose glacis. The triple turret system made it complicated to build, and this feature, once in favor in the interwar, was seen as obsolete by 1940. 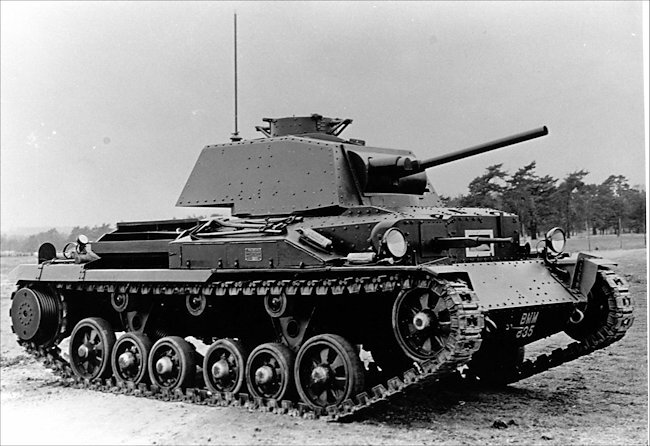 The A10 was studied by John Carden in 1934, following a specification for a 1 inch (25.4 mm) armored tank, while its speed could be slightly lower. The A9 plans were subsequently modified into the A10. Both were strikingly similar, but the two frontal turrets were eliminated and replaced by a lighter armored box, armed with a single .303 (7.62 mm) machine gun. The biggest change was the armor, raised up to 30 mm (1.18 in) on the nose and mantlet, and 14 mm (0.55 in) elsewhere, while the bottom, rear plate and rooftop were just 6 mm (0.24 in) thick. The engine was unchanged (AEC Type A179 6-cylinder petrol, 150 hp), resulting in an added weight of 2.3 tons, and a top speed reduced in effect to just 26 km/h (16.1 mph), compared to the 40 km/h (25 mph) of the Mk.I, barely more than infantry pace on rough terrain. A total of 175 were delivered, from July to December 1939, by the Birmingham Railway Carriage and Wagon Company, Metropolitan-Cammell and Vickers, entering service early in 1940. The original A10 Cruiser Mark II was armed with two Vickers .303 (7.62 mm) liquid-cooled machine-guns. They were reliable but cumbersome and inaccurate. Due to the suppression of the turrets from the Mark I design, more ammunition was carried (3000 rounds vs 4050 in the Mark II). The army designation was Tank, Cruiser A10 Mk.I. Later on, Besa machine-guns were adopted. Lighter, more compact and accurate, they helped to distinguish the new Cruiser Mark IIA (army designation Tank, Cruiser A10 Mk.II), which also received an armored radio housing. The main variant of the type was the Mark IIA CS (for Close Support, 30 produced), rearmed with a 3.7 in (94 mm) howitzer. The weapon was derived from a field gun, meant to provide smoke cover for the infantry. 40 smoke rounds were carried, along with a few HE rounds to deal with fortified positions. The Mark II was too slow to be effective as a true cruiser tank. The next Mark III, with Christie suspension, was judged superior. However, the sturdy Mark II chassis was chosen as a basis for the new Infantry Tank, the Valentine, the most produced British tank of the war. The Mark II didn’t turn out to be a successful British tank design. Its shortcomings were rooted in a series of cost-savings and peacetime compromises. To distinguish the Mark II from the Mark I, the latter was classed as a “heavy cruiser”, to underline its better protection, but much slower speed. But it was certainly not protected enough to serve as an infantry tank. In the Battle of France, were the first 21 delivered were committed with the 1st Armored Division, the Mark II seems to have performed poorly. This was due to its very slow speed off road and torsion problems with its tracks, which proved too fragile in operations. Later on, much of the production was sent to North Africa, to defend Egypt against a belligerent Italy. Their first commitment came when repelling the Italian invasion of December 1940. They then fought their way into Libya and Abyssinia during Operation Compass, where they performed well, due to a dry and flat terrain. The Italian tanks they faced were not well-armed nor better protected. Later, in Greece, 60 Mark IIAs were sent with the 3rd RTR. There, the QF 2-pounder (40 mm/1.57 in) was found deadly against German reconnaissance armored cars columns, and light tanks like the Panzer I and II. But it was unable to sustain the fire of the German main AT gun, the Pak 36, nor from the early Panzer III’s 37 mm (1.46 in). Most were lost, disabled or abandoned in April 1941. Reliability often proved an issue, as well as crew safety, due to the narrowness of the escape hatches. Captured British A10 Cruiser tank in France. It is armed with a 2pdr main gun. Note that the hull machine gun mounting on the left of the drivers position has been blanked off. Whether in the hurried re-armament plans of 1939-40, it wasn’t worth designing a Vickers machine gun hull mount. Perhaps the original plan was to fit a BESA machine gun and the design got behind production demands and it was decided that two different calibre weapons was a bad idea. It is not known at this time. A10 Cruiser Mk.II in early configuration, with three .303 (7.62 mm) Vickers liquid-cooled machine-guns. It was part of the 21 delivered which were later sent with the British Expeditionary Force (BEF) to fight in France. Cruiser Mk.IIA CS (Close Support) with the BEF, 1st Armoured Division, France, May 1940. A Cruiser II defending Tobruk, during the aftermath of the Italian invasion in December 1940. A Cruiser Mk.IIA (Besa machine-guns) during Operation Compass, the British counter-offensive against Italian forces in Libya, January 1941. The last surviving Mark IIAs were phased out by late 1941. A10 Cruiser Mk.IIA in Greece, 3rd RTR, April 1941. 60 were shipped from North Africa to Southern Greece to support the Greek defenders against much superior German Forces. 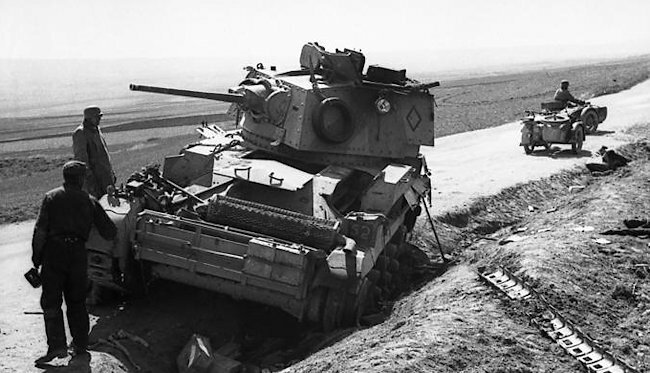 The British A10 Cruiser tank saw widespread service with the British Expeditionary Force (BEF) in France, in the desert campaign and in Greece. This one is an A10 close support tank with its main armament consisting of a 3.7 inch (95 mm) breach loading mortar. It also featured a co-axial BESA machine gun and a hull mounted BESA machine gun. Earlier tanks had a Vickers co-axial machine gun both. As far as it is known, those with the Vickers coaxial were lacking the hull mounted weapon. 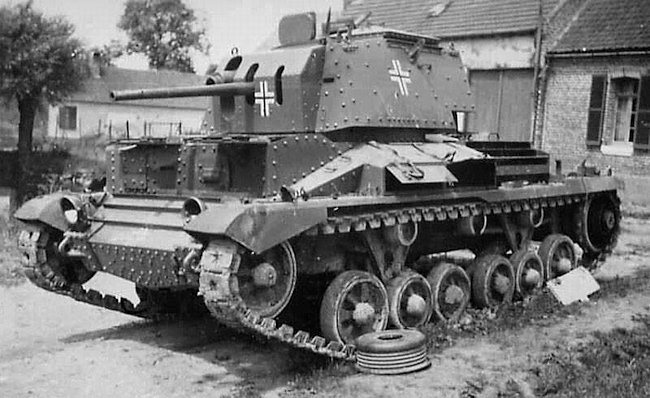 Captured British A10 Cruiser, redesignated Kreuzer-Panzerkampfwagen MK II 742(e). It is in distress as the brake drum has been removed. It is the original Cruiser Mk II type armed with a 2pdr main gun and a co-axial .303 inch (7.7 mm) Vickers machine gun. 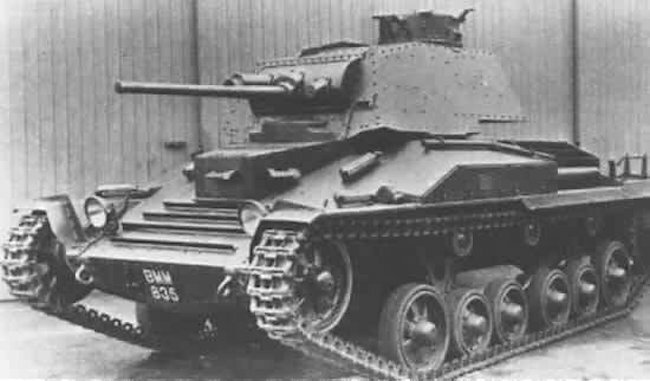 This is the prototype A10E1 British Cruiser tank. In England, Rick Wedlock is currently restoring the only surviving A10E1 wreck. It is the BMM835 Vickers Pilot model 10 ton light tank A10E1. The cupola for the tank is raised like the A13. Only the prototype has this raised cupola. -Before the BESA machine gun, the vickers used on the A10 would have fired .303 British rounds (7.7mm) not 7.62mm which would’ve been .30-06 springfield which is american.